Range hood filters available to keep your exhaust hoods clean and grease free! 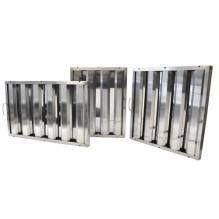 Zanduco carries range hood filters in various sizes, to fit whatever sized hood your establishment has! All of our commercial range hood filters are easy to clean, with an attractive shiny finish that will look great in your café, restaurant, or commercial kitchen!